With every generation of Tizen, brings a new and improved way of building any app on the OS that connects everything. The new iteration of the Tizen IDE is more compact and performs on any computer OS. Its new features include easier handling of certificates for Tizen Devices; user friendly interface; and a bright and light creating apps has never been seamless. 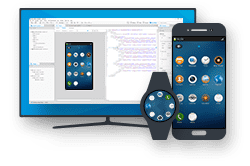 Tizen Studio brings a strong and feature packed functionality that makes creating on the OS easier than ever. Learn more & download it now! Widgets provide easy access to frequently used tasks or content. They’re useful when users are engaged in other activities or unable to precisely control their Galaxy Watch. Voice Input will allow users to quickly and intuitively interact and perform actions in various occasions including searching, replying, and etc. With built-in GPS, you can create various standalone use cases that require location-based information and GPS tracking data. for Galaxy Watch app development.